A 5mm yellow-green Montana sapphire. The stone is bezel-set in this sterling silver ring for superior security. The band is 8.7mm wide and lightly textured. A contemporary unisex ring that is one of a kind. Wear your own piece of Big Sky Country! Size 10.5. Made in Philipsburg, Montana. Yogo sapphires are known for their unique ability to have uniform clarity and stunning cornflower blue colors, this Yogo sapphire channel set band does just that, it is set with an array of stunning Yogo sapphires. This Montana Yogo sapphire ring is created in sterling silver with an anti-tarnish finish. These beautiful blue sapphires are quite different than your standard gem mountain sapphires. The violet hue of the Yogo sapphire ranges from slight to strong but make these Montana sapphires unique. Cornflower blue colors of the Montana Yogo sapphire is what makes Yogo sapphires in Montana the most sought after. Size 7 This Montana yogo sapphire ring would make a great addition to any wedding band, but can stand on its own. Did you know Yogo Montana sapphires are the birthstone of September. Show off a piece of Montana with this Montana Agate Pendant. This Montana Agate pendant is created in sterling silver and is bezel set. Perfect gift for yourself or someone special! Comes with a standard 18'' sterling silver chain. Made in Philipsburg, Montana. Every piece of Montana Agate is unique. A beautiful blue Montana sapphire set in a unique sterling silver ring. Made in Philipsburg, Montana. This sterling silver ring is one of a kind. A free-form Mexican fire agate with lots of flash and color, is bordered by a beautiful leaf design. 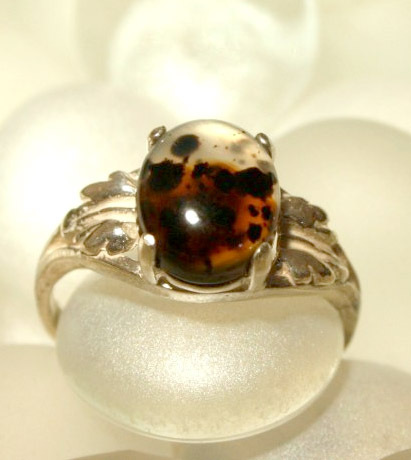 This unique ring is a perfect gift for agate lovers, or anyone who wants to add a little fire and flash to their jewelry collection. Size 5.5.